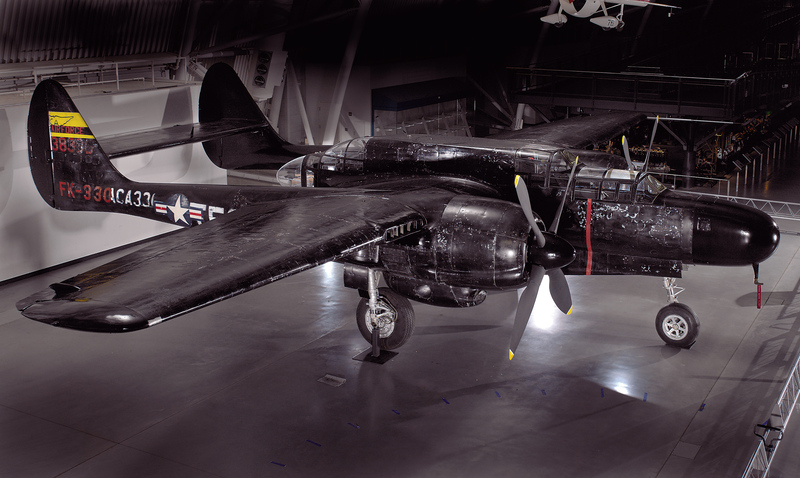 The P-61 Black Widow was the first U.S. aircraft designed to locate and destroy enemy aircraft at night and in bad weather, a feat made possible by the use of on-board radar. The prototype first flew in 1942. 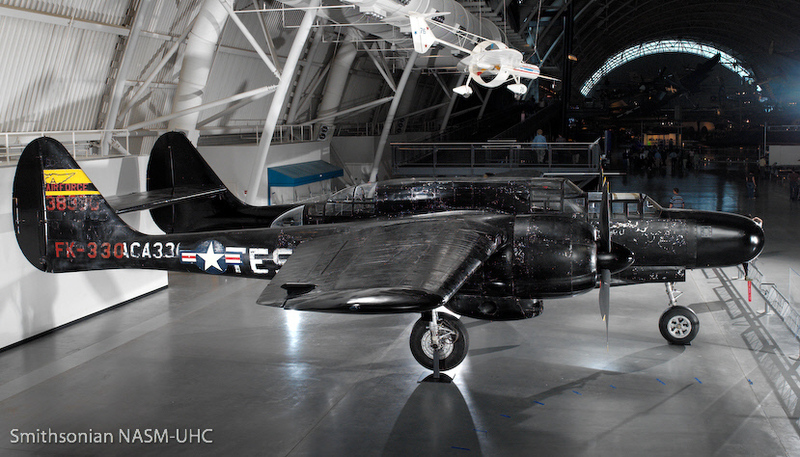 The P-61 Black Widow was the first United States aircraft designed from the start to find and destroy other aircraft at night and in bad weather. It served in combat for only the final year of World War II but flew in the European, Mediterranean, Pacific, and China-Burma-India theaters. Black Widow crews destroyed 127 enemy aircraft and 18 robot V-1 buzz bombs. Jack Northrop's big fighter was born during the dark days of the Battle of Britain and the London Blitz in 1940. British successes against German daylight bombers forced the Luftwaffe (German Air Force) to shift to night bombing. By the time Royal Air Force (RAF) Spitfires could launch, climb out, and then try to intercept these raids, the bombers crews had usually dropped their loads and turned for home. An aircraft was needed to patrol the skies over England for up to seven hours during the night, and then follow radar vectors to attack German aircraft before they reached their target. U.S. Army Air Corps officers noted this requirement and decided that America must have a night fighter if and when it entered the war. The Army awarded a contract to Northrop on January 30, 1941. The resulting design featured twin tail booms and rudders for stability when the aircraft closed in behind an intruder. It was a large aircraft with a big fuel load and two powerful engines. Armament evolved into four 20 mm cannons mounted in the belly firing forward and a powered, remote-controlled turret on top of the center fuselage equipped with four .50 cal. machine guns. The three-man crew consisted of the pilot, a gunner seated behind him, and a radar observer/gunner at the rear behind the gun turret. Only the pilot could fire the cannons but any of the three could operate the machine guns. Simultaneously, work was proceeding, at a laboratory run by the Massachusetts Institute of Technology, to develop the airborne radar set. The Army tested an early design in a Douglas B-18 in 1941. The much-improved SCR-520 set was ready by early 1942. Meanwhile, Army enthusiasm for the XP-61 produced another contract on March 10, 1941, for 13 service-test YP-61s. 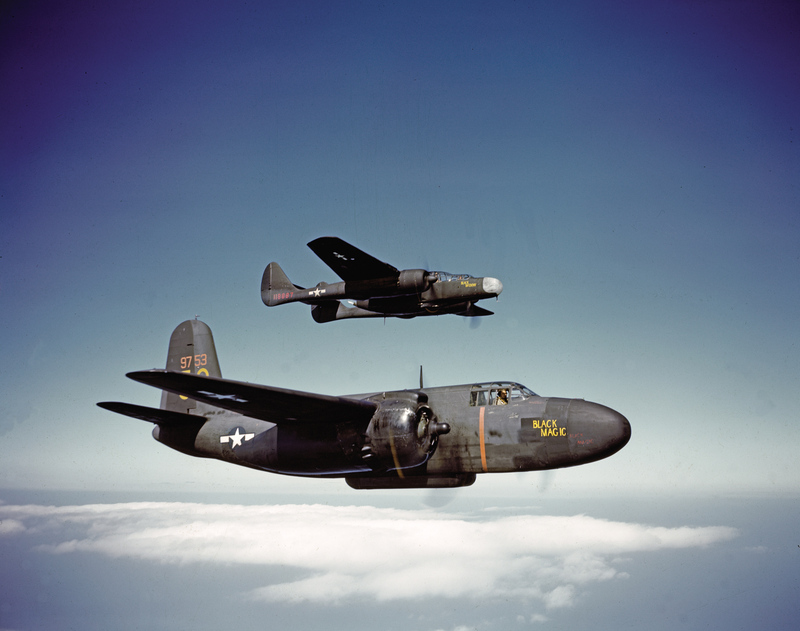 Even before these airplanes flew, Northrop received orders for 410 production machines! Northrop test pilot Vance Breeze flew the aircraft on May 26, 1942. 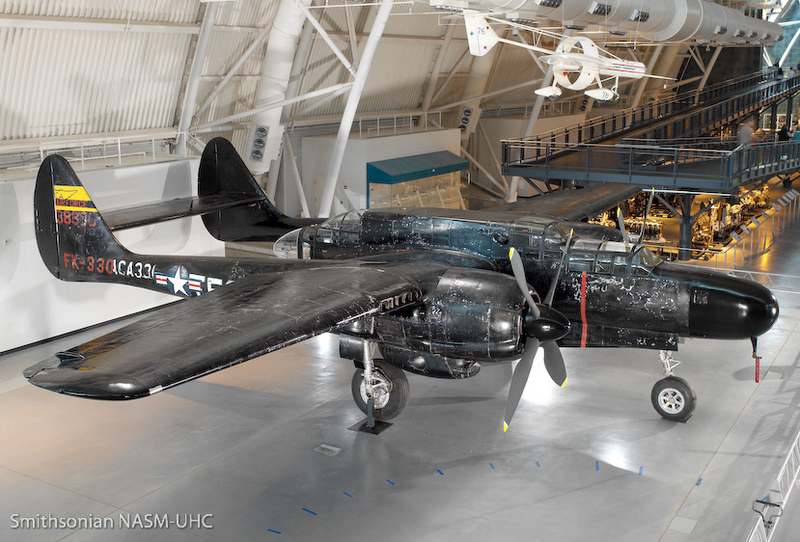 Although the Black Widow was nearly as large as a medium bomber, it was a true fighter. The only prohibited flight maneuvers were outside loops, sustained inverted flight, and deliberate spins. As Northrop advanced the design toward production, supply problems arose and modifications became necessary. 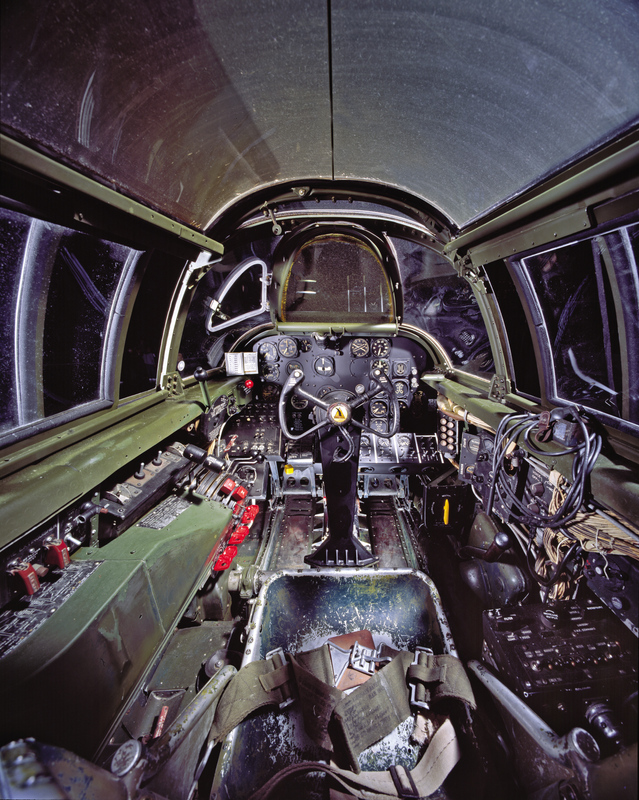 The 4-gun top turret was the same type fitted to the top forward position on the Boeing B-29 Superfortress (see NASM collection) and that bomber had production priority over the P-61. 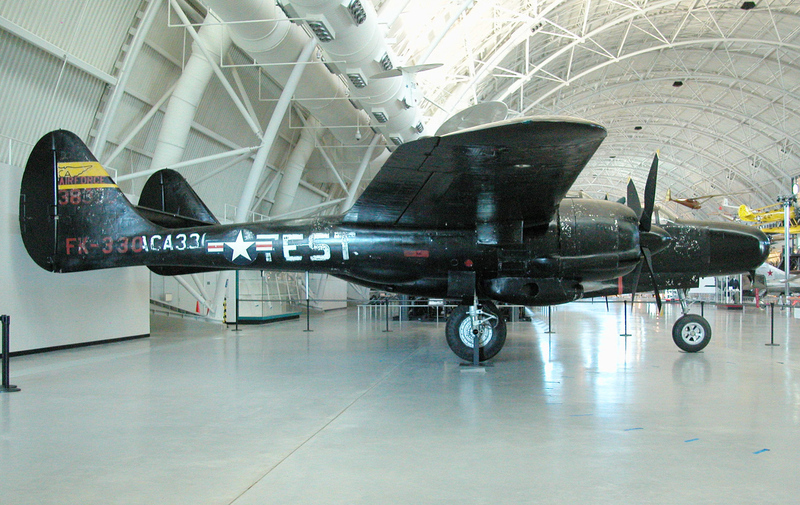 As a result, several hundred P-61s did not have this turret. Those that did experienced buffeting when the turret was traversed from side to side and a fix took time. 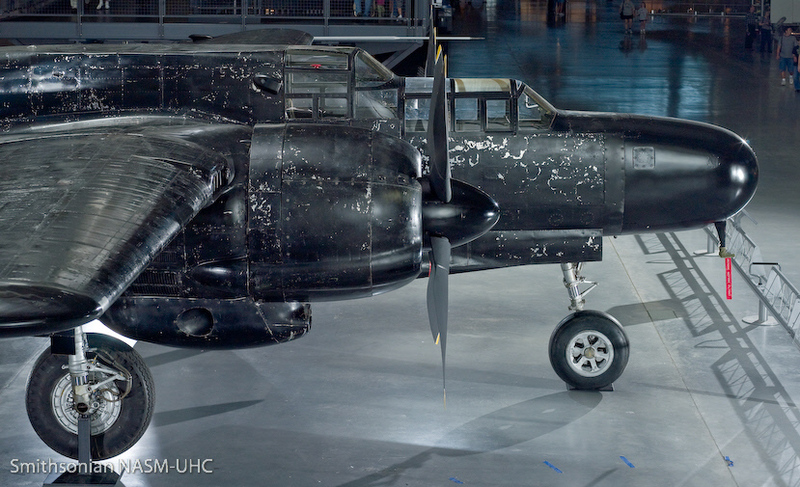 By October 1943, the first P-61s were coming off the line. Training started immediately, and the first night fighters arrived in the European Theater by March 1944. Combat operations began just after D-Day (June 6) and the Black Widows quickly departed from their original role as defensive interceptors and became aggressors. They flew deep into German airspace, bombing and strafing trains and road traffic and making travel difficult for the enemy by day and at night. 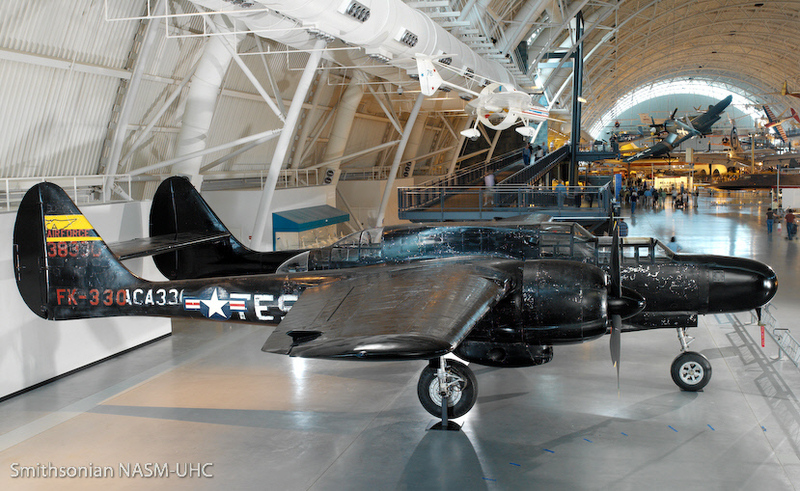 P-61s arrived in the Pacific Theater at about the same time as the European Black Widows. For years, the Japanese had operated lone bombers over Allied targets at night and now U. S. fighters could locate and attack them. 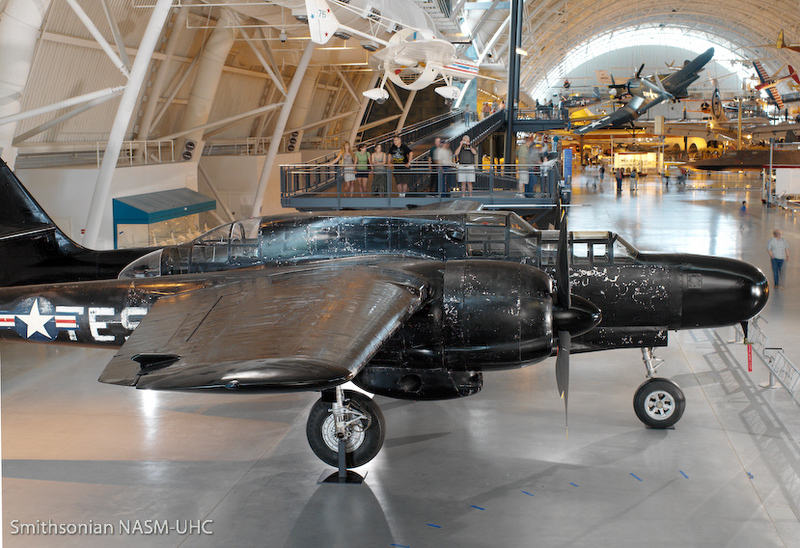 However, on June 30, 1944, a Mitsubishi BETTY (see NASM collection) became the first P-61 kill in the Pacific. Soon, Black Widows controlled the night skies. 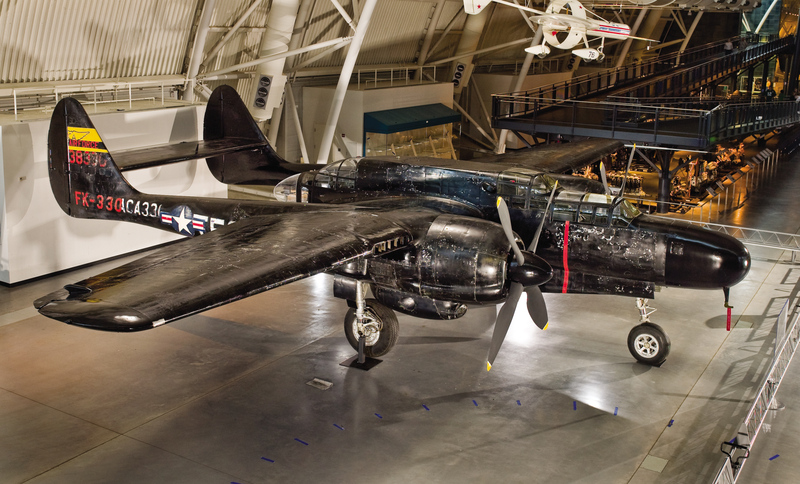 On the night of August 14-15, a P-61 named "Lady in the Dark" by her crew encountered an intruding Nakajima Ki-43 Hayabusa (Peregrine Falcon) OSCAR (see NASM collection) and eventually forced it into the sea without firing a shot. Although the war was officially over, no one was sure that all of the Japanese had heard the message and stopped fighting. The American night fighters flew again the next night and "Lady in the Dark" again found a target. It was a Nakajima Ki-44 Shoki (Demon) TOJO and the fighters maneuvered wildly as they attempted to gain an advantage. The P-61 crew lost and reacquired the Ki-44 several times then finally lost it for good and returned to base. The next day ground troops found the wrecked TOJO. In the darkness, Lady in the Dark's crew had forced the Japanese pilot to fly into the ground, again without firing a shot. With the war over, the Army cancelled further production. Northrop had built 706 aircraft including 36 with a highly modified center fuselage. These F-15As (later redesignated RF-61C) mounted a number of cameras in the nose and proved able reconnaissance platforms. Many of these airplanes participated in the first good aerial photographic survey of the Pacific islands. A few, plus some special purpose P-61s, stayed in active service until 1950. 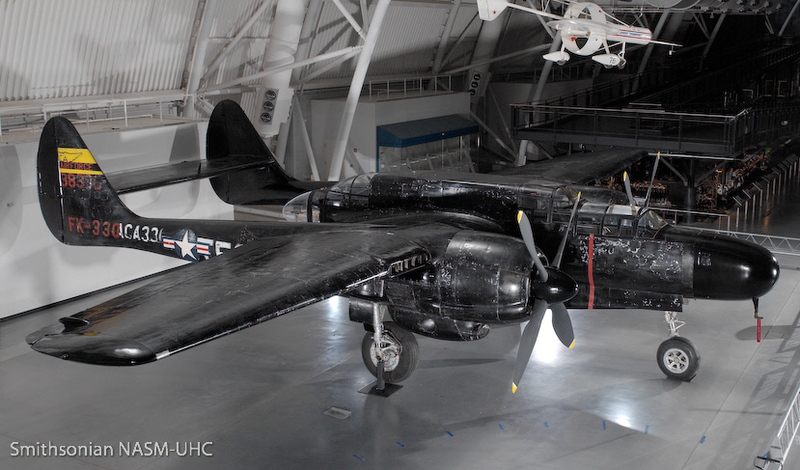 NASM's Black Widow is a P-61C-1-NO, U.S. Army Air Forces serial number 43-8330. Northrop delivered it to the Army on July 28, 1945. By October 18, this P-61 was flying at Ladd Field, Alaska, in cold weather tests and it remained there until March 30, 1946. This airplane later moved to Pinecastle Air Force Base, Florida, for participation in the National Thunderstorm Project. The project's goal was to learn more about thunderstorms and to use this knowledge to better protect civil and military airplanes that operated near them. The U. S. Weather Bureau and the National Advisory Committee for Aeronautics (NACA) undertook the study with cooperation from the Army Air Forces and Navy. 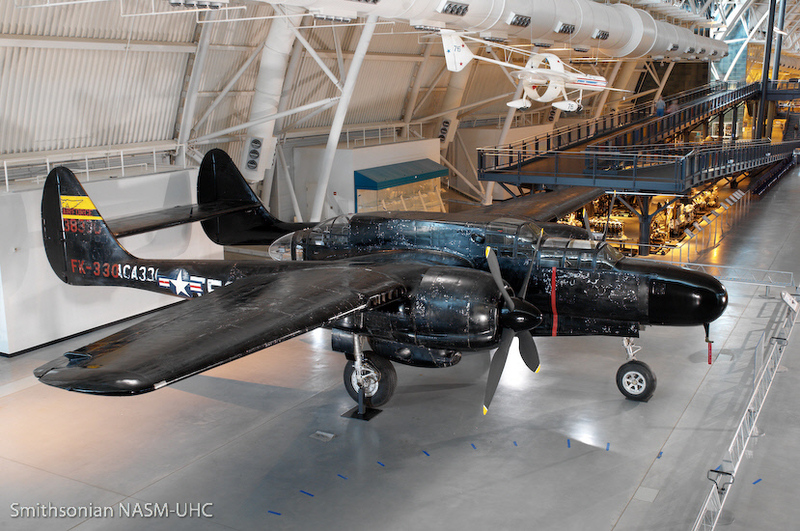 With its radar and particular flight characteristics, the P-61 was capable of finding the most turbulent regions of a storm, penetrating them, and returning crew and instruments intact for detailed study. Pinecastle personnel removed the guns and turret from 43-8330 in July 1946 to make room for new equipment. In September, the aircraft moved to Clinton County Army Air Base, Ohio, where it remained until January 1948. The Air Force then assigned the aircraft to the Flight Test Division at Wright-Patterson Air Force Base, Ohio. After declaring the airplane surplus in 1950, the Air Force stored it at Park Ridge, Illinois, on October 3 along with important aircraft destined for the National Air Museum. But 43-8830 was not done flying. 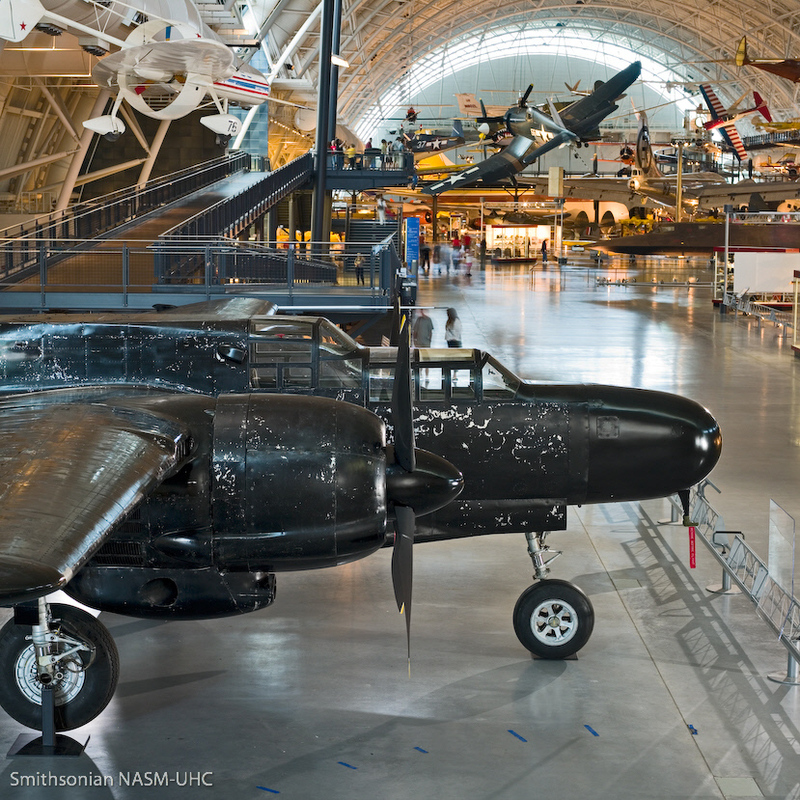 NACA asked the Smithsonian to lend them the aircraft for use in another special program. The committee wanted to investigate how aerodynamic shapes behaved when dropped from high altitude. The Black Widow arrived at the Ames Aeronautical Laboratory, Naval Air Station Moffett Field, California, on February 14, 1951. NACA returned the aircraft and delivered it to the Smithsonian at Andrews Air Force Base, Maryland, on August 10, 1954. 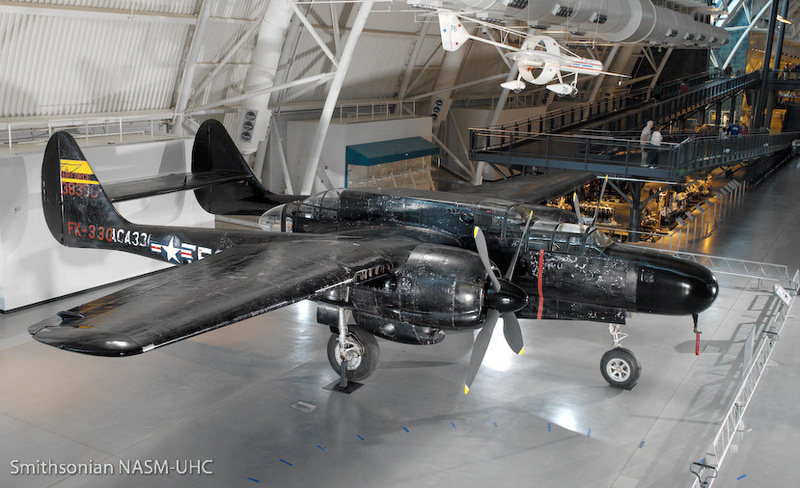 When the engines shut down for the last time, this P-61 had accumulated only 530 total flight hours. The three different paint schemes from its past service life have been revealed by carefully removing individual layers of paint.